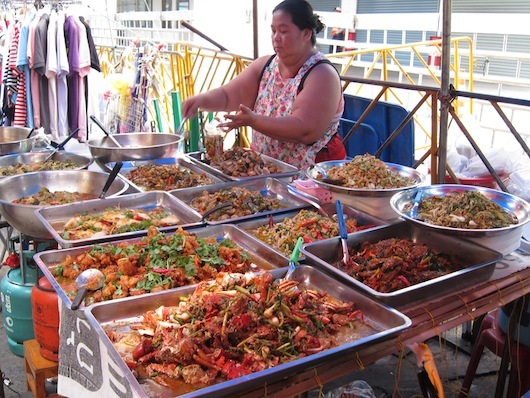 Patpong night market and the surrounding area on Silom Road is highlighted in most guide books as one of Bangkok’s best places to shop and eat. 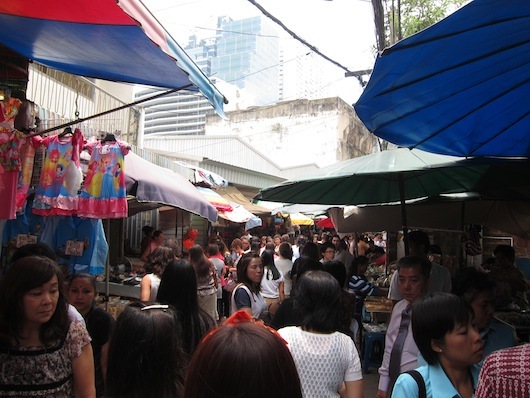 Yet we reckon there's a better market right in the Silom area where you’ll likely be the only foreigner in sight. It’s called Lalai Sap, and it emerges from a maze of unassuming side streets every week day. In the shadow of high-rise office buildings and hotels near the busy intersection where Silom Road meets Naradhiwas Road, Lalai Sap is set back in a network of narrow alleys and open-air buildings. Countless tourists hang around the main roads of this area, but they’re generally unaware of Lalai Sap’s existence right around the corner. It turns into a steady stream of people around noon. 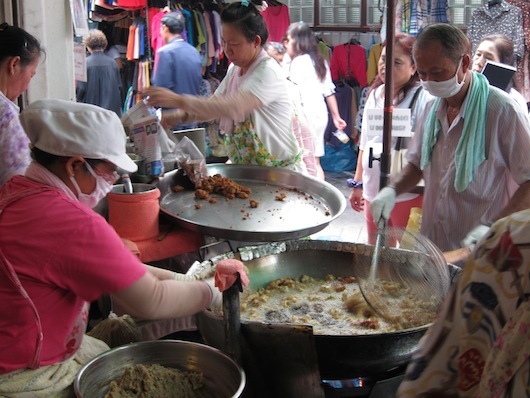 Unlike many Bangkok markets, which are often focused on, for example, clothing, prepared foods or fresh foods (but not all of these together), Lalai Sap offers a little of everything. Expect to see shoes, fresh veggies, baked goods, toys, fresh fish, cheap clothes, and all sorts of prepared foods, all in the same place. Closer to the main roads, you’ll find carts offering fresh fruit sliced to order, Thai-style coffee and tea, and finger foods like Chinese-style veggie dumplings, sai krog (northeastern Thai sausage), and tod mun pla (fried fish cakes). A well oiled fish cake machine. Don’t fill up on the snack-y stuff though. Deeper inside Lalai Sap stretch a host of sit-down restaurants, which include all the noodles and som tam you can eat. If entering the market from Chong Nonsi BTS Station (the lane marked by Top Charoen Optical), take the first left to find excellent roast duck in soup with ba-mii (egg-wheat noodles) or on rice at a shop marked by a white sign with red Thai script. Go further still to find a food court style sit-down area where you can choose between any number of Thai classics, including curries and stir-fries at the khao gaeng (curry and rice) shops. Don't worry, seats open up quick. 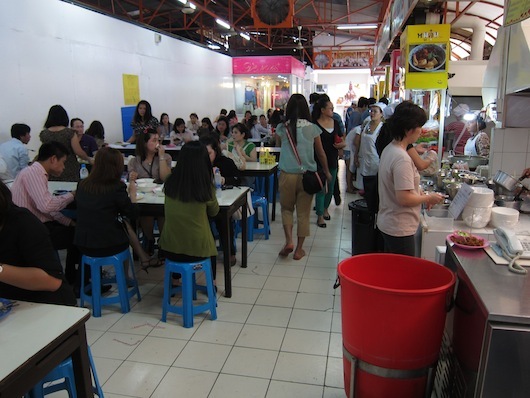 While the indoor spots are convenient for a quick and cheap sit down lunch, we’ve become partial to a woman just outside the food-court area who dishes out some home-made stir-fries and salads for take away that really hit the spot. 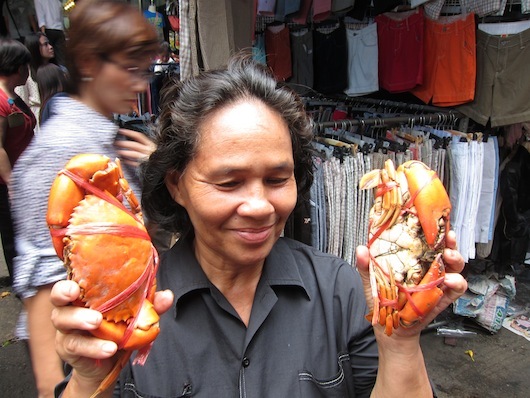 See those orange-yellow stir-fried hunks just above the crab in the picture below? That’s spicy pumpkin and you’re going to want to try it. If only I could afford to hire you as my private chef. After filling your belly, Lalai Sap is also a great place to pick up that 200 baht dress that’s been on your mind. While clothing and shoe stalls are mixed in with food throughout the market, a large indoor boutique area is entirely devoted to clothes. Shopaholics, be warned — just when they seem to come to an end, another fresh strip of wears will magically appear. To get here from Sala Daeng BTS Station, head west on Silom Road for about a half kilometre and take a left down one of the alleys before the major intersection where the sky train track curves to the left (just look for the vendors lining the alleys). If coming from Chong Nonsi BTS Station, take exit 4, then walk straight at the bottom of the stairs and take the first right down the side street at Top Charoen Optical. Last updated on 28th August, 2017.